Kashmir is the crowning glory of India, with the great Himalayas extending right through it. One falls short of words while describing its pristine beauty. From time immemorial, it was known for its spiritual aura and finds a mention in many great epics. About 25 km from Srinagar, nestled in the cantonment area and surrounded by serene Chinar trees is a little marble temple. It does not attract only Hindu devotees but Sikhs as well. The name comes from the fact that the temple serves ‘kheer’ as prasad. With spring waters flowing past, the enchanting beauty of this temple mentioned in many famous mythological stories is a very interesting Kashmir temple for devotees to visit. One experiences a captivating sense of spirituality and serenity here. It is popularly believed that the colour of the spring water changes as devotees approach the deity. One of the most ancient temples in the region, this was founded around 200 BC and visited by the great Hindu seer, Adi Shankaracharya. This Kashmir temple stands atop a hill. Formerly a shrine with only a shiv ling, an idol of Shankaracharya was later installed. King Gulab Singh of the Dogra clan built steps on the hill leading to the temple in the 18th century and the Maharaja of Mysore visited the temple in 1925. As historically significant as it is, it also provides a scenic view of the enchanting Dal Lake. If you are a history buff, the Shankaracharya Temple must feature among your places to visit in Kashmir. 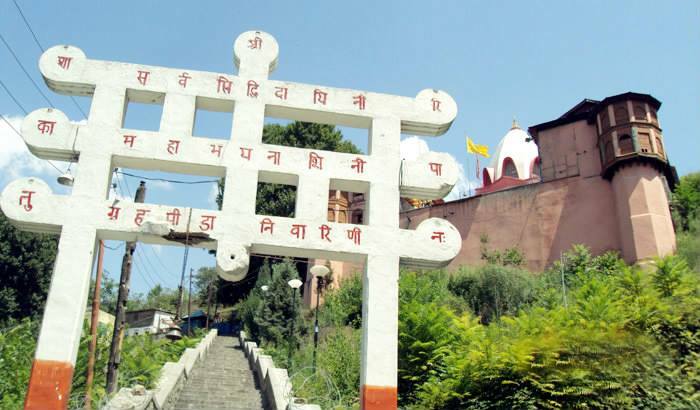 Dedicated to the presiding deity of Srinagar, Sharika Devi (a form of goddess Durga), this temple is situated atop Hari Parbat, a hill overlooking Srinagar. The main deity of Jagadamba Sharika Bhagavati is uniquely depicted with 18 arms. Held very sacred among Kashmiri Pandits, it is a shrine visited by devout Hindus in large numbers. On the day considered to be the birthday of the goddess, a special dish called ‘taher charvan’ is offered to the deity. Also famously known as the Soorya or Martand Temple, this was built by King Laitaditya during the 8th century CE and dedicated to the Sun God. The temple now stands as a ruin, though it is still a fine testimony of the Kashmiri architecture prevalent in those times. It is a beautiful blend of Gandhara, Gupta, Roman, Chinese, Syrian-Byzantine, and Greek forms of architecture. One can also view the entire Kashmir valley from this point. The sheer charm and grandeur of this Kashmir temple must be experienced by every tourist. With so many places to visit in Kashmir, plan a stay at a good and comfortable Kashmir resort. For a unique experience, check into a Club Mahindra houseboats in Srinagar, which you can find parked at exclusive spots on Dal Lake. Local delectable cuisine will thrill your taste buds, as will the hospitality by a superbly courteous staff. Check out the Club Mahindra reviews online about the Srinagar houseboats for more information and get ready for a memorable tour of the Kashmir temples! This entry was posted in Jammu and Kashmir and tagged major temples of kashmir, spiritual temples in kashmir, temples in kashmir. Bookmark the permalink.